We’ve seen how to use cohorts to chart long-term retention trends, evaluate the behavior of customers you’re acquiring across acquisition channels, and calculate the payback on campaigns or promotions. Assess your business’ health by flipping from “cohort time” to “calendar time.” Up until now we’ve focused on comparing groups of customers at analogous points in “cohort time”: that is, how did one cohort behave three months into their lifetime relative to the way another cohort behaved at their own three-month mark? But you could flip the scenario and ask a slightly different question. At a particular moment in calendar time -- for example, June 2013 -- how much revenue or profit was contributed by the May 2013, April 2013, March 2013, etc. cohorts? The distinctive “layer-cake graph” produced by looking at cohorts in calendar time (see below) can provide powerful insights into the health of your business. At a given point in time, what percentage of your revenue or profit came from new vs. repeat customers? Tracking how that ratio has changed over time can give you insight into whether you’re fueling top-line growth solely through new customer acquisition - or whether you’re continuing to nurture those relationships with your existing customers over time. Test whether a particular cohort is statistically different from your “average” cohort. You notice that a particular cohort looks like it’s trending above your long-run average: the revenue/customer appears higher at the one-month, three-month, and six-month marks. But how can you be sure if this is a meaningful difference - or is just due to random chance? Quantitatively-oriented marketers may want to test for a statistically significant difference between the cohort in question and the average cohort. The first step is to define a timeframe for observation and testing: for example, is this cohort different from all other cohorts at the six-month mark? Then run a two-sample t-test of means (for metrics like profit or revenue per customer) or of proportions (for metrics like repeat rate or member-to-buyer conversion), treating the cohort in question as one sample and all other cohorts as the other sample. Conducting this type of analysis can give you certainty into whether certain acquisition channels, campaigns, or tactics are attracting customers who are meaningfully more or less valuable than usual. Use cohorts for forecasting. Although every cohort is unique, cohorts tend to evolve in predictable ways -- and you can leverage what you know about how a cohort progresses over time to make predictions about entirely new groups of customers. That is, by the two-week mark, a particular cohort has already spent more than half of the total revenue that you can expect from that group of customers over a two-year period. 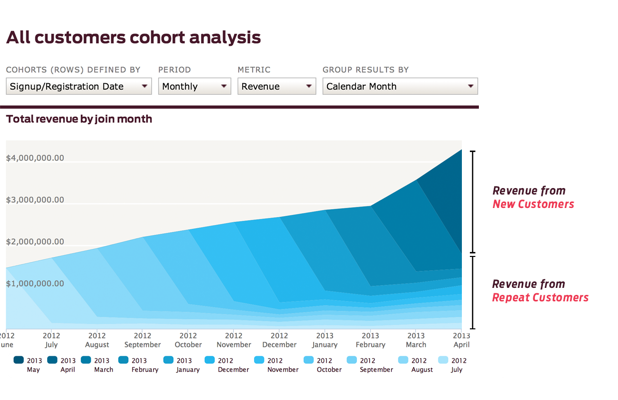 Knowing how the typical cohort evolves over time enables you to forecast the behavior of a new group of customers. Say you acquired a new customer cohort, and in their first 14 days they spent an average of $105 per customer. Using the cohort forecasting curve, you can predict that this cohort will spend an average of $105 / 60% = $175/customer over two years. If this sparks your interest, you can download this workbook simulating a cohort's future behavior: It lets you plug in historical cohort numbers to simulate a new cohort's future value.